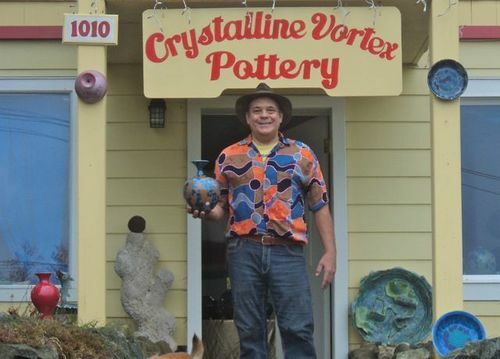 Welcome to the Crystalline Vortex Pottery Studio/Gallery at 1010 3rd. Ave.Plopped right on the 49th parallel in lovely Ladysmith, BC. just 3 blocks up the hill from Trans-Canada highway. We specialize in Crystalline Glazed Stoneware, fired to cone 10 and soaked for 6 hours at 2000f degrees to grow zink silicate crystals. We are also the owners of Happy Zak Products. Home of the best organic lotion on earth..!